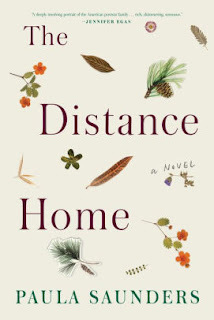 The Distance Home by Paula Saunders is a very highly recommended family drama which is beautifully written while brilliantly depicting a highly dysfunctional post World War II family living in West River South Dakota. René narrates the story of her contentious childhood in South Dakota, beginning on the plains next to the Missouri River in Fort Pierre, and later in the foothills of the Black Hills in Rapid City. Set in the 1950'and 60's, her parents, Al and Eve, married young and lived in Al's parents' basement, where Leon and René were born. Al is a cattle trader, which means he spends more time away from his family than at home, so Eve must make a life for her children. She also fights to overcome the blatant favoritism Al and his mother show to René, by favoring and fighting for sensitive Leon, who is mocked and treated harshly by Al and his mother - first for his stutter and later for dancing. Eve signed Leon up for a tap dancing class, and later ballet, when he showed a natural aptitude for dance, which Al cannot accept. When René shows the same natural ability for dance, she is applauded and praised. The battle lines are clearly set, with Eve defending Leon and Jayne and Al favoring René. When the family moves to Rapid City, the gulf between parents and children widens and worsens. The parents are constantly battling each other when Al comes home. His disdain for Leon is as obvious as his favoritism for René. Sides are clearly drawn: Eve defends Leon; Al prefers René. Al even ignores Leon's many accomplishments playing baseball and never attends a game. The epic battles and the abusive punishments doled out to Leon result in both Leon and René being diagnosed with PTSD as adults. Leon turns to self-destructive behavior, while René tries to excel at everything. The novel follows their abusive childhoods through René's narrative. Occasionally inserted in the story is information from future discussions shared between Leon and Rene as adults. They provide a glimpse into the fallout from their childhood and the destruction that resulted. Families are complicated organisms and Saunders clearly captures this in The Distance Home. It has been said that the novel draws on Saunders's own family history, which makes perfect sense because the turmoil, emotions, and the prevailing attitudes of that period in American history is captured so completely. The character who is most fully developed is René, especially since she is the narrator and is telling the story. Leon's character is also fairly well-developed through her eyes. Jayne's character is not fully formed, but there can often be a disassociation between older and younger siblings. Between the parents, Eve is the most fully realized character, but then she was also the main parent who was with the children daily while Al was usually traveling. Saunders did an excellent job depicting the conflicting emotions René felt toward her mother, and the final resolution of them was touching. This is truly one of the better novels I've read this year and it is a notable debut novel. It is immediately going on my list of contenders for the top ten novels of the year. Hopefully Saunders will be writing another novel soon.